Digər mətnlərə əsasən bir hüceyrədə xüsusi mətni necə göstərmək olar? 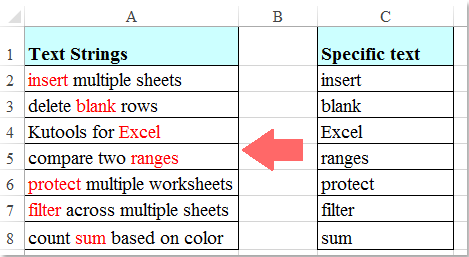 Excel-də, müəyyən bir mətnə ​​əsaslanan hüceyrələri vurğulamaq bizim üçün asan ola bilər, amma burada, bütün hüceyrə deyil, görkəmli olmaq üçün bir hüceyrə içərisində xüsusi mətni vurğulamaq istəyirəm. Bu, əksəriyyət üçün çətin ola bilər. Bu yazı, bu işi Exceldə həll etmək üçün bəzi fəndlər haqqında danışacağam. Bir hüceyrə içərisində mətnin yalnız bir hissəsini vurğulamaq üçün aşağıdakı VBA kodu sizə kömək edə bilər. 1. Xüsusi mətni vurğulamaq istədiyiniz hüceyrələri seçin və sonra basıb saxlayın ALT + F11 düymələri açmaq üçün Proqramlar üçün Microsoft Visual Basic pəncərə. Başqa bir vəziyyət, ilk sütunun mətn dizələrini içərdəki iki sütun var və ikinci sütun xüsusi mətndir, indi ikinci sütundakı xüsusi mətnə ​​əsasən birinci sütundakı nisbi mətni vurğulamaq lazımdır. MsgBox "not support multiple columns"
MsgBox "the selected range can only contain two columns "
In the above two codes, which code do you want to identify case sensitive? We will modify the code for you! 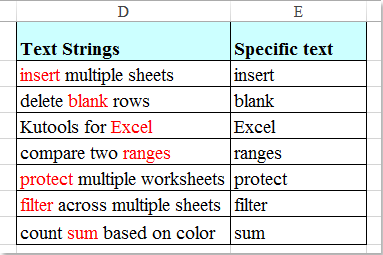 "find and mark keyword1, keyword2 and keyword3 in all text strings also when one string contains more than one of these keywords (all of them should get highlighted in the specific text string)"
Why idoes the "(x)" have to appear where it is? Is the value of x passed to the Split function as a named argument without the name? I would really like to understand this concept.Thank you for your help and this function. I have learned something I didn't know. how could i get this code to work but have it highlight in a color other than red? Please try it. Thank you! Can anyone help me for a code to " copy those highlighted word in a different column ". It worked great for me, thank you for sharing this with the world.